The prophet here carries a scroll with no inscription so he cannot be identified. Jesse Trees with their kings and prophets were produced in all types of religious art from the 11th century and throughout the medieval period and there was no standard convention for the depiction of the prophets and the kings. The style of painting on this figure is the same as on those in panels 5A to 5C-1881. The facial features are thin and angular. The lines forming the eyebrows and eye sockets are painted in sharp arches. These features and the lack of inscriptions on their scrolls distinguish this group from the other panels in the series which have full, more rounded, facial features and bear inscribed scrolls. The whole figure in this panel is the reverse of that in no. 5A-1881 indicating that they were made from the same cartoon or design drawing. Full-length figure of a man with a full of head of long hair and a beard. His head is surrounded by a halo composed of yellow glass. The figure is in profile facing the right side of the panel. His right arm and hand are raised and are indicating to the right. He is wearing a green overmantle over a green tunic. He holds a brown shawl over his left arm which swirls out behind him towards the left side of the panel. The figure wears yellow boots or stockings. 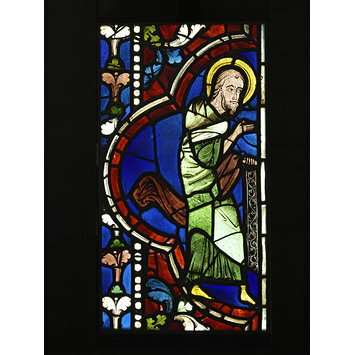 He holds a black scroll in his left hand which hangs straight down alongside vertically placed pieces of clear glass which form the border of the right hand side of the panel. The scroll is composed of clear glass with a thick matt black coat of pigment which has been scratched away with a fine stylus to reveal a floral frieze. The figure is placed within a half quatrefoil. His left foot rests on top of the lower inner border of the quatrefoil and his right foot is placed across the lower inner border of the quatrefoil. There are floral sprays of blue, green and clear glass in the upper and lower spandrels of the quatrefoil. On the left of the panel is a vertical border of floral sprays composed of clear, green and brown glass. This border floral pattern is broken in the middle where it is dissected by the left projection of the quatrefoil. (late 18th and early 19th centuries) Approximately 60% of the ambulatory chapel glazing, the oldest windows int he building, were destroyed. 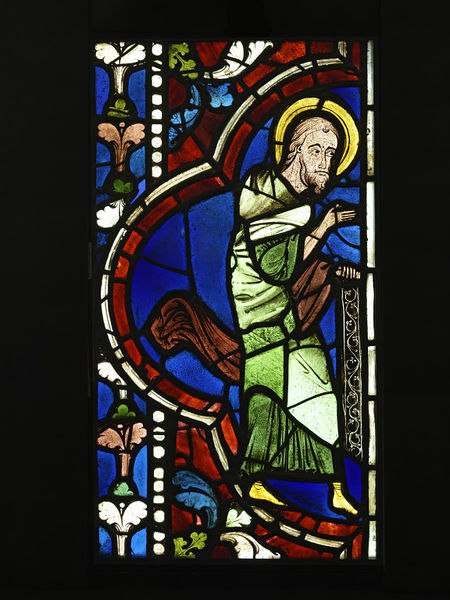 (1837-8) Arnaud was the first to attempt, professionally, the restoration of stained glass at Troyes. He copied borders from Saint-Denis and Chartres. (1860s-end date of 1869) Vincent Larcher (19th century glass painter who had been commissioned to restore some of the Troyes glass) was praised for his use of a new scientific technique - a lead oxide was applied to the exterior of the glass to serve as a simulated patination that would filter the incoming sunlight. He carried out the restoration of the ambulatory chapels and choir of the cathedral. Henry Vaughan bequeathed 5 pictures to the NG in 1900 and also a collection of Turner pictures to the NG, Scotland. Christopher Baker has written a book about the Turners entitled 'J.M.W. Turner: The Vaughan Bequest' within which you will find biographical information on Henry Vaughan.